Adelaide-based automotive technology company Supashock has announced the launch of its Automated Load Handling System (ALHS – 17), a pioneering technical solution that significantly improves efficiency and safety for the loading of containers and other items onto vehicles. Developed in partnership with with Rheinmetallfor use on the company’s logistic vehicle (HX77 8×8), the 17 tonne system significantly minimises risk by introducing the unique capability of automated loading and unloading of ISO containers, modules and STANAG compliant flat racks of up to 17 tonnes from within a highly protected truck cabin. 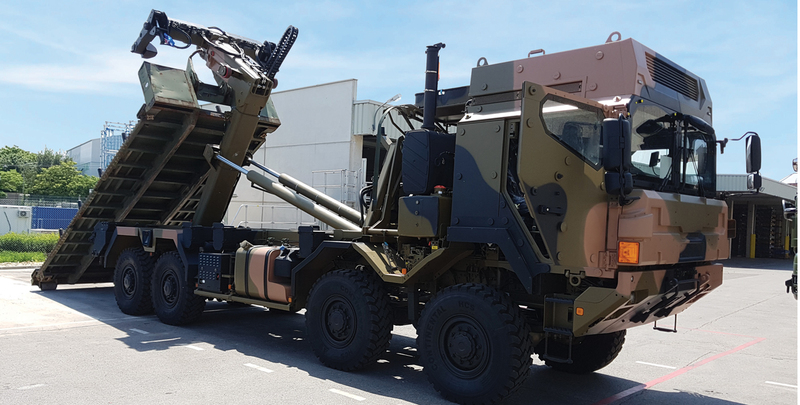 The ALHS – 17 was officially unveiled at Eurosatory 2018 by Australia’s Minister for Defence Industry, Mr Christopher Pyne. “This partnership demonstrates the power of a global prime and an Australian small to medium enterprise collaborating to deliver cutting-edge technology and significant export opportunities,” Minister Pyne said. Michael Wittlinger, Head of Rheinmetall’s Logistic Vehicle business unit, said the the ALHS 17 employs the use of automated technology that eliminates the need for manual loading or unloading of military equipment under challenging scenarios. “Supashock has truly revolutionised the concept of integrated load handling systems for military applications,” Mr Wittlinger remarked.